So let’s as they say “begin at the beginning”. Do you watch “Two and One Half Men”? If so you may have seen the episode where Allen is going to write a book and the only thing he could come up with is “It was a dark and stormy night” Well our first meeting was on a dark but not stormy night. I had joined the Air Force right out of high school in 1962 and after completing my eighteen months of duty at Anderson Air Force base on the Pacific Island of Guam, was now stationed at March Air Force Base near Riverside, California. I was moonlighting at a Chevron Gas Station on University Ave. in Riverside. On this night three of my Air Force buddies had bought a big bottle of “Vin Rose” wine and were visiting me at the Chevron Station. It was late October or early November 1964 and the nights were chilly in Southern California. Out in the station’s lube bay there was a “Smug Pot” to warm thing up out there. Well my buddies became quite drunk early in the evening and had formed a circle laying around that Smug Pot. One would throw up a little and then scoot around the Smug Pot causing the two others to scoot around some too. Then it would be another one’s turn and more scooting. I was quite amused by this! Then the bell went off that indicated someone was at the pumps and probably wanted some gas. 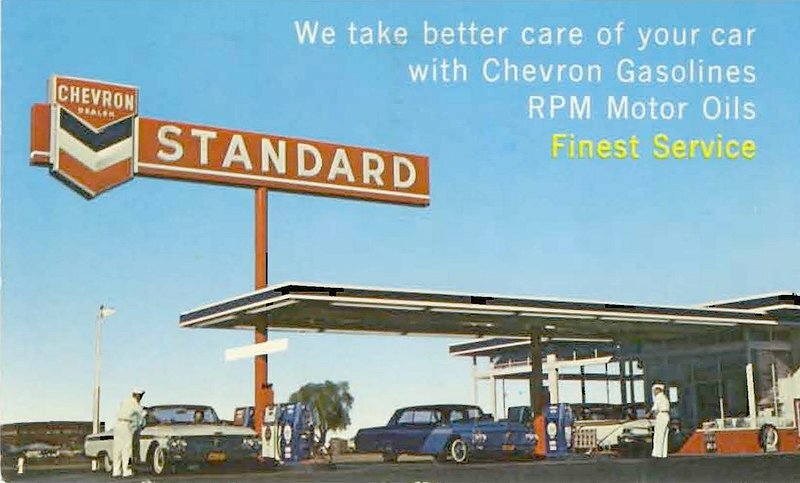 Back in those days every station was a full service station which meant that the attendant would come out – pump the gas for you, wash your windshield, check your oil and air up your tires if you so desired. Late at night it was common just to put the gas in and collect the money. Well Paula was driving her 1958 white 2 door Chevrolet Biscayne with Linda Barker as her passenger and asked for $1.00 worth of gas. Way back then that was about 4 gallons of gas because the price per gallon was $.25 or less most of the time. I started the gas and went to wash her windshield so that I could get a look at their legs — Nice Ones! After pumping the gas I came up to the driver’s window to collect the dollar and said not “How are you”? or something proper like that I asked Paula if they would like to go to the mountains for a drive with me the next day. She asked her friend Linda and Paula asked me if I had a friend to bring along. Of course I said yes I did and got her phone number to call for directions on where to pick them up. The next day I called the WAF (Women in the Air Force) that I had previously made a date with to go driving up to the mountains and broke that date. I went looking for a buddy to take with me to pickup Paula & Linda. Joe Pixley filled the bill perfectly. He was a really big guy and was a real nice fellow but I choose him so that I would have my choice between Paula & Linda. I had wanted to be with Paula and that’s how it worked out but months later she told me that Linda wanted to be with me and she was just going along so Linda could be with me — until I showed up with Joe in my 1958 red Ford convertible. So off we went up to Big Bear or somewhere in the San Bernardino Mountains with snow on the ground. I found a nice place to park – got out and stuck the wine bottle in a snow bank to chill and got back in the car to start making out. Paula was a very good kisser and I was smitten by her good looks and her sweet personality. after an hour or less I went back out to get the wine and found out snow doesn’t make a very good wine chiller. I didn’t & still don’t like wine but will drink it if it’s Ice Cold. This wasn’t even close so I didn’t drink hardly any of it before passing it back to Linda & Joe. Linda probably needed it pretty bad. So we didn’t stay long and headed back to Riverside. On the way back I asked Paula if she would be My Girl and she said yes. Looking back I mean what else could she say to such a catch as me!